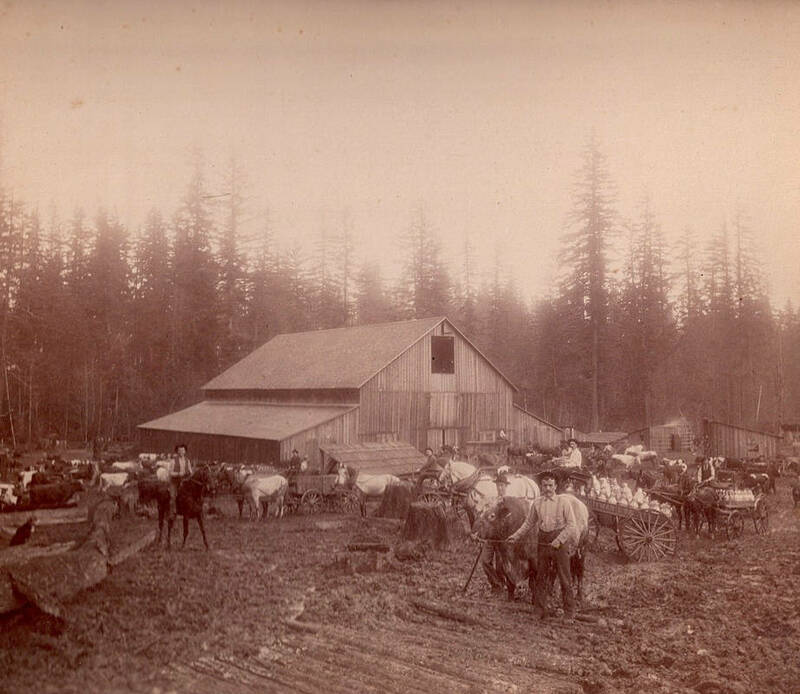 Peter Gertsch pulling his prize bull at the Gertsch Family's Shattuck Dairy at Garden Home, Oregon in the early 1900s. Other area residents with wagons hauling milk appear behind him, alongside a herd of dairy cows, the dairy barn, and other outbuildings. A log road appears in the foreground. The Gertsch Family were Swiss immigrants who originally settled in Garden Home in the 1890s. The family's dairy was on the west side of Oleson Road, north of the Frank Farm. Family members ran the dairy in the same location until the 1950s. This photograph may depict Peter Gertsch Sr. (died 1895) or his son, Peter Gertsch (born 1895).